Dentures allow us to regain full and beautiful smiles. If you’ve recently acquired dentures you may not know exactly how to properly care them. Here are six ways to keep your dentures and mouth feeling and looking great. Food can get stuck in the area between your dentures and gums. As soon you’re finished eating, take your dentures out carefully and run water over them to get loose particles and debris out. Stick to lukewarm or cold water because hot or boiling water can damage the shape of your dentures. Gently brush your dentures each day with a soft-bristled brush to get rid of plaque, food and buildup. Clean especially well in the grooves that fit against your gums to remove any adhesive. Don’t forget to use a non-abrasive denture cleaner. Anything else could ruin your dentures. Avoid products with bleach or whitening properties since they are known to weaken dentures. In order for them to keep their shape, dentures need to be kept wet, but you cannot simply soak them in water. Instead, you will need denture solution. Your dentist will recommend a brand for you to use and explain how to properly store your dentures while they are soaking. Many people soak their dentures overnight which is great because it gives their mouth a break.Remember to rinse your dentures before putting them back in your mouth the next morning. After you’ve removed your dentures to clean them and give them a good soak, gently clean the rest of your mouth. Your tongue, gums and palate require daily brushing too. You can do this with a soft-bristled brush or washcloth. Again, avoid anything with bleach or whitening properties. Your dentures need to be handled with care. Anytime you remove your dentures for cleaning, put a towel down so that if you drop them, the towel will be there to catch them. Visit your dentist for yearly checkups to have your mouth and dentures professionally cleaned. 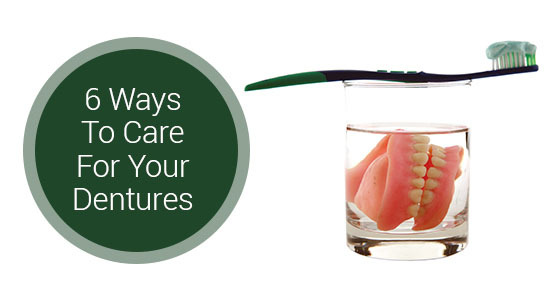 With proper care, you will be giving your dentures a long life (between 5-10 years.) If, however, you notice that your dentures are loose or are causing irritation, call your dentist ASAP. Don’t wait until you have an infection.